Where do I begin? Let’s start with a little story, shall we? Once upon a time there was a man who wrote a book. That book was called ‘See How They Run’. It was very good and I was a bit sad when I had finished reading it as I thought it would be hard to match. 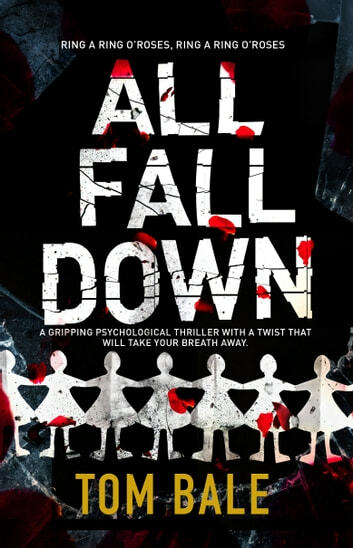 Then the man wrote another book and he called it ‘All Fall Down.’ And it was better than very good. It was bloomin’ fantastic. If ‘See How They Run’ had you double checking all your doors were locked before heading to bed, thinking twice about accepting packages for your neighbours, or getting twitchy at every strange gurgle from the central heating in the night, then ‘All Fall Down’ may well put you off barbecues and certainly won’t help you develop a Good Samaritan outlook on life. It is a story which quickly highlights the danger of keeping secrets and failing to be honest with each other. It also showcases the plight of the vulnerable in society, those who are left to become victims. Of those who fall foul of stronger personalities, happy and eager to be manipulated in exchange for a sense of belonging and acceptance. Of how far beyond a person’s moral code they can be pushed to venture with the right conditioning. And how some people are just plain deranged. More than anything else, it is a suspenseful read as just when you think you may have the motivations behind the senseless attack on the stranger sussed, finding the ‘truth’ just as soon the characters think they know, Bale throws another successful curveball. It is soon hard to know who, if anyone in the family, is really linked to the attack on the man. The tension builds from the very start, a sense of foreboding and growing menace developing from the interspersed chapters told from a third party point of view, someone the reader cannot yet identify but who clearly has some kind of agenda for bringing about anarchy. Someone who will be very bad news for the Turners. The characterisations are, as always, spot on. Rob and his wife Wendy are going through their own troubles, ones which are not helped by the arrival of the stranger at their door. The distant nature of their relationship is subtle and yet effective. Their children are equally dysfunctional. Twins Evan and Josh are chalk and cheese. Josh is absent, reluctant to speak to his family or commit to their holiday - a clear division existing between him and his parents - whereas Evan is almost the perfect son, supportive of his family and keen to act as peacemaker. Their daughter, Georgia, has demons from her own past, the exact nature of which is slowly built up throughout the story. And as for the manic idealism with which the gang view their deranged leader and the indecision they show without his guidance, it is wholly believable. There are moments in this when you may pause for breath, poised and waiting to know what cruelty will be dealt to the family next. But, despite perhaps not entirely trusting the Turners throughout, you will be rooting for them. And the reason for the attack on them, though seemingly senseless at first, probably won’t dissuade you from being on their side when the truth is finally revealed. If anything it will serve to demonstrate the true level of psychosis involved. But it is the ending which is perhaps the most shocking. A final showdown with a life changing, if not wholly surprising conclusion. I read through this is a few hours because I really couldn’t put it down. From maybe a third of the way through, there was a kind of inevitability as to what was going to happen to the Turners, but it was exactly this that wouldn’t let me walk away without finishing. And I think that's one of the things I like the most - a book which not only draws you in, but compels you onward until you have missed the best part of a day lost in its world. And Mr Bale's books never fail on that score. An absolutely brilliant, thrilling and heart pumping read that, once again, I’m gutted to have finished. One of those spine tingling thrillers with a finish you couldn't guess. Not for the faint hearted with the author writing graphically about murder, torture and unthinkable acts that can be inflicted upon the human body. I love thrillers and this book didn't fail in making my heart race. Great quick read! I say this because I couldn't put it down! Lots of twists and turns as well as family issues. Would read this author again for sure! I enjoyed this book from start to end. Another great beach book.